Cloud N9ne CBD Flower (Strain: Purple Haze). 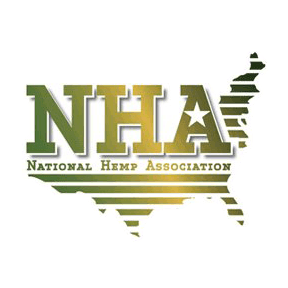 This product contains less than .03% Delta 9 THC and is non-psychoactive. The terpenes on this thing…WHOA. Never smelled hemp flower this strong. Seriously impressed by the smell profile. The effects are deeply relaxing, making it a great night-time smoke. Had sticky fingertips after breaking it up. Burns like a dream. Cure & trim are perfect. Really digging the chillum too. Only complaint is paying for Priority shipping & getting First Class. 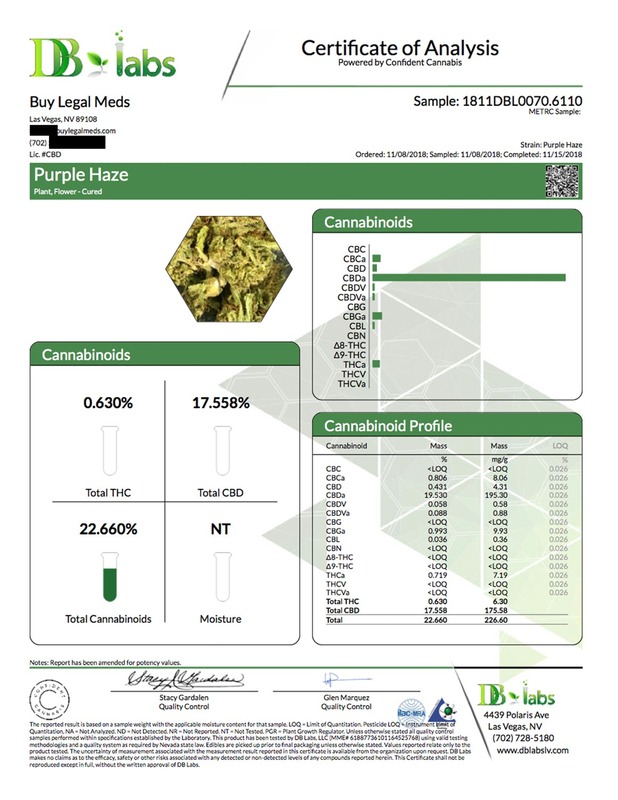 Also would like if a THC content report was included in the order for security reasons. But not a huge deal. Would order again. A+ for quality. 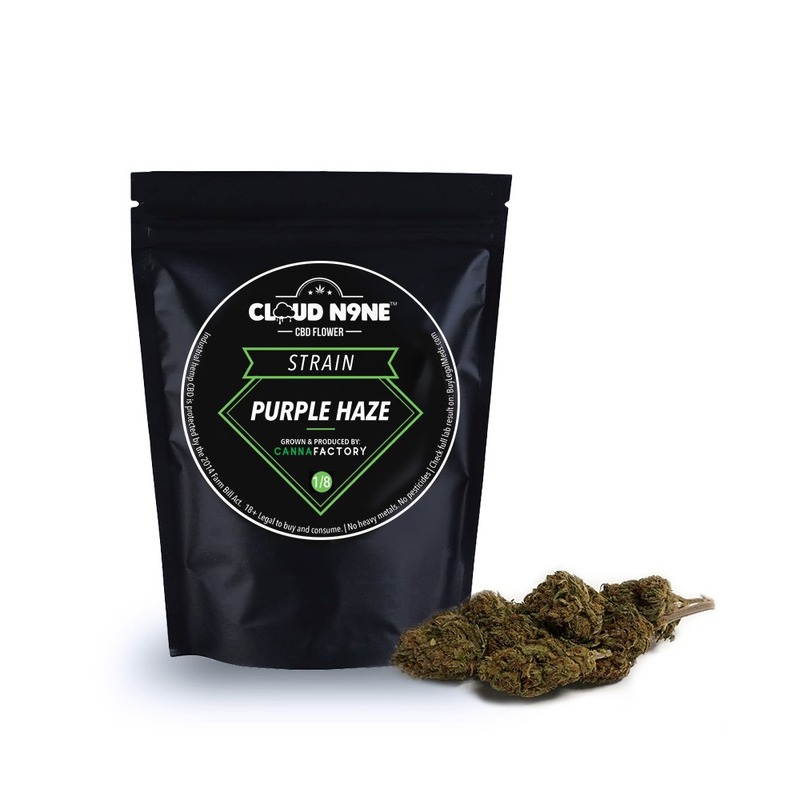 Before I bought any CBD I did my due diligence and did a lot of research on it, I went online and saw a bunch of products from different stores ” web pages ” and at the end I bought Purple Haze strain from Buylegalmeds.com and it was the best decision I’ve made in a long time, I work a bunch of hours and it’s stressful and had problems sleeping and sence I been using your product I sleep like a baby!!! I will recommend your product to anyone. Bought this product for my sister, who has been suffering from anxiety issues for the past few years. With it only getting worse since coming to college, I figured it would be worth trying for her. She has since ordered more flower and has been much more focused and resourceful. Excellent item! Great strain very smooth to smoke, it also has a great smell.